Osprey Kestral 38 is well placed in the Osprey line up is perfect for cold weather hiking as a day pack or lightweight overnight trip (if you don’t require much gear such as sleeping bags, mats and staying in catered accommodation). I don’t believe this pack would be ideal to hike in hot humid environments such as Kokoda due to the location of the water bladder, which is an external access point. This tends to make the bag buldge and is very tight to get a 3L bladder in and out to fill. This compartment is ideal for stowing your iPads/tablets and when in transit though airports a great place to stow your passport in a passport folder as when on your back it would be almost impossible for the best thief to swipe you most important belongings. The pack boast an integrated rain cover is a nice touch as is the smart and functional ‘stow and go’ trekking pole feature is quick and easy to use as well as being comfortable to hike with the poles stowed. The waist belt and padding is wide and super comfortable even when spending 8 hours attached to your hips. The zipper pockets are large enough to fit a beanie, snack bars and hand cleaner etc. My only complaint would be the side mesh pockets, which, while functional, don’t allow you to access a bottle easily without taking off the pack. But in all honesty I’ve learned that sometimes it’s good to stop, take off the pack, sit and drink. A built in break isn’t a bad thing. The pocket material I have found in the past with other packs to be a little frail and easily damaged and when compared to the Osprey Stratos mesh pockets falls well below par on quality. The pack is slightly over the size regulations for acceptable carry-on luggage, but if it isn’t bulging out of the seams, then you will be able to get on with most carriers (I still haven’t had to have my Kestrel 38 checked in) and even Jet star haven’t questioned it yet who seem to be a bit tougher on these regulations. 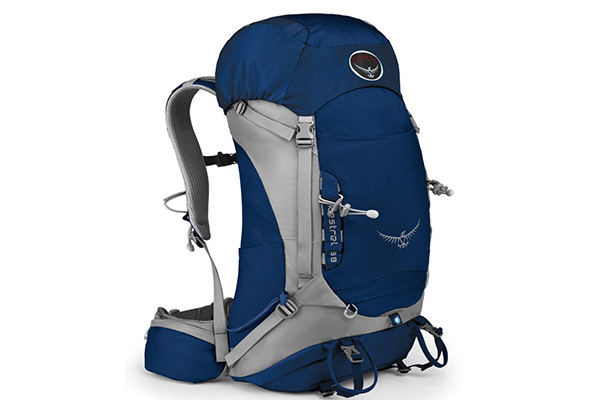 The pack is comfortable, fits everything I need and is generally well designed. I’m not fond of packs with the trampoline style back air circulation system for cold climate treks. These places can get very windy, so I don’t want my back exposed to the cold. The Kestrel 38’s air cooling system is flatter and seems to keep me cool in warmer climates and won’t expose my back too much when its cold. The ‘rip and stick’ back panel allows you to dial in the perfect torso fit and the molded foam back panel has never delivered anything less than a comfortable ride. The last thing that any hiker or backpacker wants is to have their most important gear let them down at an inopportune time. I’ve never felt anything less than confident with my Kestrel and can highly recommend this product to anyone who demands quality in his or her gear.